Pure luxury - Shoes at the Tod’s Outlet store at OUTLETCITY METZINGEN! Tod’s shoes, such as the Gommino moccasin with its studded sole, are undoubtedly one of the greatest icons in fashion and style history. Then, as now, Tod’s shoes represented Italian footwear that satisfies the highest standards in terms of quality and finishing due to the traditional closeness to handcrafting and exquisite materials. The inspiring concept from creative director, Alessandra Facchinetti, breathes new life into all of the traditional Italian company’s collections – a concept that harmoniously combines the traditional with the spirit of the times. The result is an effortless balance between a great legacy and continual reinvention. “Living well is an art” – this philosophy is part of Tod’s identity and the aspiration inherent in that simple sentence is once again reflected in the quality and outline of the leather icons – the Tod's shoes. Be inspired by the understated and relaxed charm of the Italian luxury label. At Tod's outlet in OUTLETCITY METZINGEN, you will find a selection of Tod's bags, leather goods, exquisite accessories and footwear for the discerning customer. Third-generation owner managed, and still mostly family-run today, Tod´s traditional Italian design house has a long corporate history to look back on. Over 100 years ago, with a small shoe factory, Filippo Della Valle, shoemaker and grandfather of the company's current boss, Diego Della Valle, laid the foundations for a success story that tells of much hard work, great craftsmanship and the creative spirit of Italian fashion. In that story, the company’s recent history is inextricably linked to one Tod's shoe: the Gommino – a leather moccasin whose sole is adorned with precisely 133 rubber studs. What was originally designed as a shoe for racing car drivers in the 1950s was given its characteristic shape in Delle Valles’ shoe factory and precisely 133 rubber studs as its distinctive trademark. And so the signature footwear was born and it has not lost any of its appeal or currency over the centuries. With timeless appeal, and across every trend, Tod’s has, not without reason, found many enthusiasts and today, as then, continues to fulfil its promise of top quality and exquisite materials with its Tod’s shoes. You will find a huge selection of shoes and select leather goods from the Italian luxury label in the usual excellent quality and at attractive prices at the Tod’s Outlet Store in OUTLETCITY METZINGEN. At Tod’s outlet in the OUTLETCITY METZINGEN, you will find numerous, wonderful luxury pieces. Italian design in perfection – that is what the name Tod’s stands for as a luxury brand. Within it, there are no limits in terms of variations: pure, clean styles stand alongside flamboyant eyecatchers. Tod’s is much better understood if you consider footwear and fashion to be an expression of an attitude towards life that has many different facets. The unifying feature is the distinctive style which is based on traditional craftsmanship on the one hand, and Italian lifestyle with its casual charm on the other. With Tod’s shoes, enjoy wearing Italian craftsmanship and a piece of fashion history on your feet. Also discover the huge selection and variety of luxury leather goods, handbags and accessories from the traditional Italian manufacturer at the Tod’s outlet. 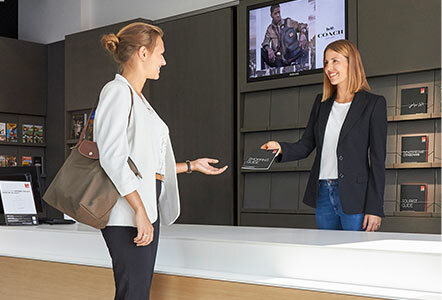 Enjoy competitive prices with a visit to Tod’s outlet store as well as the wide variety of other outlet stores for coveted luxury brands at the OUTLETCITY METZINGEN.